This guide will give you an overview of how to enable your DKIM & SPF records from within your cPanel web hosting account. 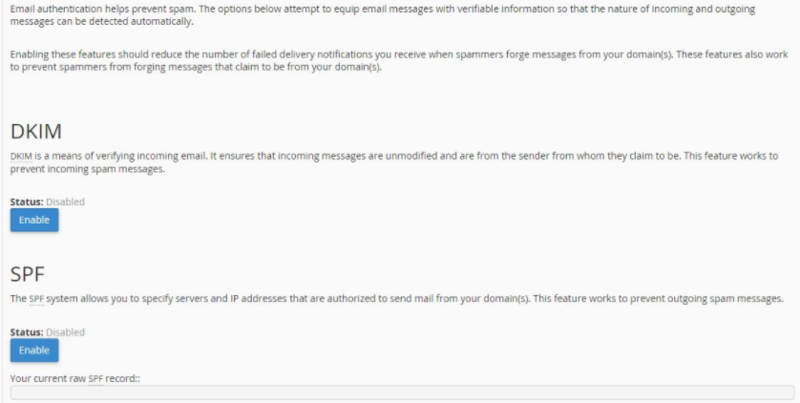 When sending emails that use your domain as the sender, you always want to ensure that you have the correct SPF records enabled on your domain. Doing so will help increase the validity of the emails being sent. Next, you’ll see the options similar to shown below. If these are disabled, you will want to click “Enable” for both the SPF option & the DKIM option. Once you have enabled both options, they will then show as “Enabled” & your raw SPF record will be presented under the value that shows “Your current raw SPF record“. In the event you have problems with SPF records, please feel free to contact our support. Depending on which hosting plan you have, there may be additional modifications required for your SPF records after they have been created.